And if you’re busy doing things then you’ll have a more interesting conversation. I am flat tired of hearing people tell me how wonderful (or awful) their kids are, how they aren’t feeling well (too much time on your hands if you’re wallowing in pity), and how you don’t like politicians / umpires / coaches / your kid’s teachers / what is happening on your television show. *yawn* Can you see me looking for the door? See the twitch going at the side of my eye? That is brought on by boorish people. I feel I must fight to not be pulled down into that rut. Christian Concert by Aura, June 25 at the Guymon Junior High Auditorium at 6:30 pm, free admission. Healthy Moment at the YMCA (for everyone) from 5 – 6 pm and you have a chance to win $100 … and several other things! That’s on June. 26. Art Camp for 4 – 18 year olds (different times for different ages) is June 26 and 27 at Wild Horse Art Gallery. Then on the 28th are for those 17 years old and up. Yvonne Sangster is the instructor. Call 338-4278 for more information and prices. PTCI’s Summer Jam on June 28 from 8 am to 3 pm at 2222 NW Hwy 64 with free food, prizes, live music, drinks, bounce house, and much more! 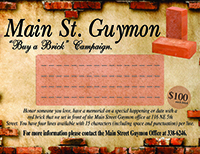 Taco Dinner and Bingo Evening fundraiser for Main Street Guymon, at Sr. Citizens Center, June 30 starting at 5:30 pm. Those are upcoming events that could be a lot of fun. How about doing something that improves your skills and talents? Free Spanish and English classes are offered at the Church of Latter Day Saints, 5402 N. Memorial Drive (north of the cemetery) on Tuesdays and Thursdays at 7 pm. The Ready Group’s primary goal is to provide education and social time for those who have lost a spouse or find themselves single. They have an educational program each month on the 2nd Saturday of the month at 9:30 am. The meeting and brunch take place at the First Christian Church, 8th and Quinn (enter through the glass door on the north). All are welcome. Improve your speaking skills (isn’t anyone that won’t benefit from this) by attending a Toastmasters group. There are two and they meet Thursday mornings at 6:30 at Ambassador Inn Restaurant or the other group that meets Tuesday evenings at Main Street Guymon office at 7 pm. You’ll be a better salesperson, teacher, administrator / manager when your presentations skills improve. Learn how to play the wonderful card game of Bridge every Thursday night in the First Christian Church, 802 N Quinn, at 7 pm. All welcome! We are all better humans when we continue to improve in some way. Find something that fills you with enthusiasm. Volunteer. Be a Pink Lady or Pink Fellow at the hospital. Work out at the YMCA. Plant some flowers and take care of them. Clean a closet and give some things away to people that will use them. Make a scrapbook of your favorite trip with the scrapbookers. Play cards or board games with friends or neighbors or kids who need a little attention. Join one of the Lions Clubs or Rotary. They need you. If you act decent, or almost decent, they want you. Step out! Get moving. Take a walk. Go buy a gift for someone who isn’t expecting it. See you on the bricks with enthusiasm!